Not just another Tudor tale. 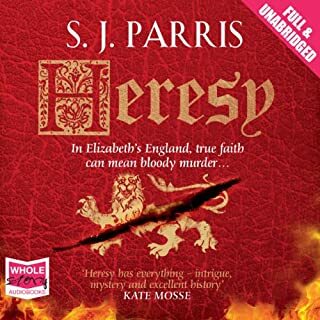 What did you like most about Heresy? I read, or have books read to me, for entertainment as I go about my solitary work; I am no scholar of history. These stories are very entertaining. Beneath the doings of the great and the, perhaps, not so good, of the Tudor era, there are other layers of life and ordinary beings. The author brings to her writing a strong whiff of the streets and stews, ordinary households and ordinary folk of the period , while also remaining intimately involved with the life of Court and politics. As well as locating us in the times, meeting Walsingham, Sydney and Dr Dee decorates the narrative with the larger than life, exotic characters that normally populate Tudor historical fiction - and fact. She fashions a bridge between the great and the grit and grunge of life then. Actually, quite a short space, as it turns out. One can feel the discomfort of a sopping wet travelling cloak and set it against a cup of warm, spiced wine before a decent fire in a candle-lit chamber: fetid hovels and marble halls, raddled doxies and fine ladies. And then there's the intrigue and action. What other book might you compare Heresy to, and why? PF Chisolm's Sir Robert Carey series. Featuring a Courtier and an ordinary man - with a regional accent - solving mysteries in Tudor England. Similar but different. And, of course, CJ Sansom's Shardlake chronicles, featuring a lawyer and an ordinary man - with a regional accent - who solves mysteries in Tudor England. Different but similar. Have you listened to any of Laurence Kennedy’s other performances? How does this one compare? Adventures of a Tudor Poirot. I love it - did you get that?